For best results, use one of the hotter or milder Indian Madras curry powders in this dish. 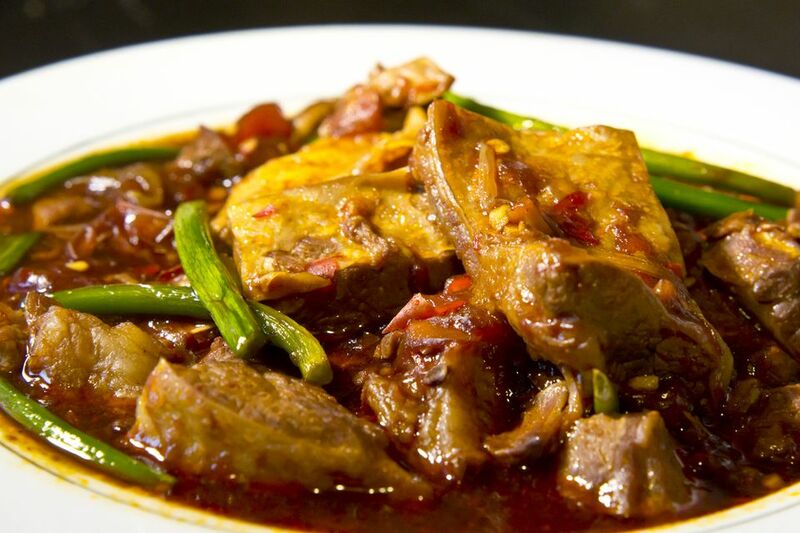 Cantonese beef curry serves 3 - 4 as part of a multicourse meal. Cut the beef across the grain into thin strips, approximately 1 1/2 inches long and 3/4 inch wide. Peel and chop the onion. In a small bowl, combine the chicken broth, dark soy sauce, sugar, and salt. Set aside. In another small bowl, combine the cornstarch with water and set aside. Preheat the wok on medium-high heat; the wok is ready when a couple of drops of water sizzle are added. Pour 1 to 2 tablespoons oil to the wok, drizzling to coat the sides. When the oil is hot, turn the heat down to medium and add the onion. Add the curry powder, brown briefly, then add the water to make a paste. Turn the heat back up to medium-high. Push the onion to the sides and add the beef in the middle. Sear for about 30 seconds, then stir-fry until the redness is gone, about 2 minutes. Splash the beef with the rice wine or dry sherry while stir-frying. Add the sauce to the wok. Bring to a boil and cook for another 2 to 3 minutes. Remove the wok from the heat. Give the cornstarch and water mixture a quick re-stir. Stir the cornstarch and water mixture into the sauce. Return the wok to the burner and continue stirring until the sauce thickens. Serve hot over rice.